Looking to upgrade that border or bed? Look no further than Puschkinia libanotica. With its soft color, fast growing habit and an unusual form, it is the perfect plant for bringing a modern look to any traditional garden space. 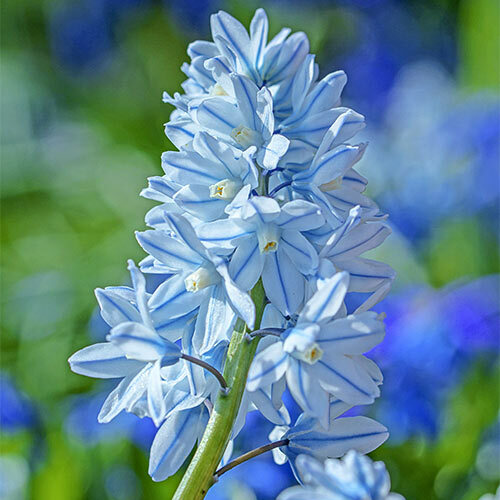 Cone-shaped panicles bear petite white florets that are generously striped and shaded with both bright and grayish-blue hues. For the greatest impact, plant this unique perennial in drifts along a front border, in rock gardens, under a stand of trees or in between evergreen shrubs. This versatile plant also makes an attractive ground cover, spreading its beauty and color throughout the entire area. Naturalizes like a dream, reappearing yearly in greater number and increased vigor. Small cupped flowers, many per stem. Flower cluster is approx. 3" in length. Blooms similarly to hyacinths.